But why does the seahorse connote such idyllic imagery? Well, according to ancient Greek and Roman mythology, seahorses were attendants of Poseidon, or Neptune, the god of the sea, and possessed extraordinary strength and power. Some believed they transported the souls of dead sailors to their final resting place and certainly sailors have always considered seahorses to be good luck charms. Chinese cultures believed them to be some kind of sea dragon, which inevitably linked them with good luck; whilst the Celts saw them as symbols of courage at sea. 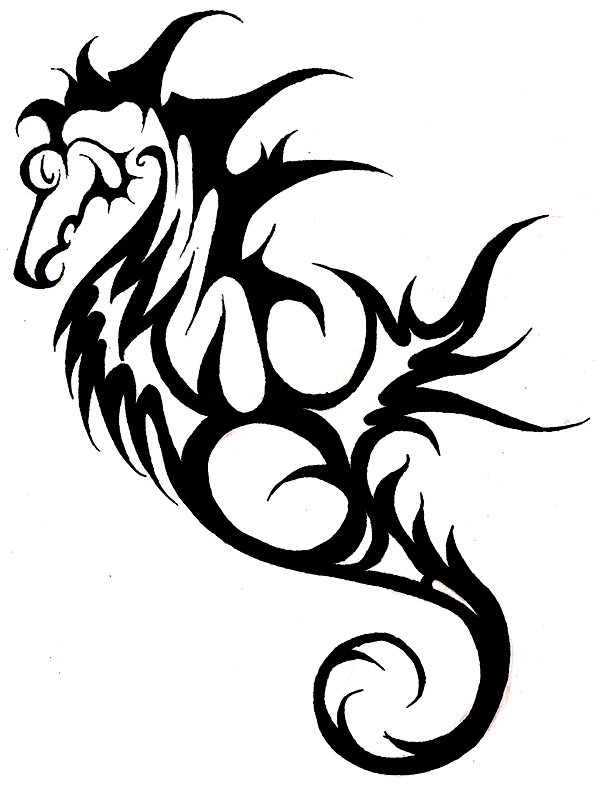 Understandably then, seahorses became emblems for safe travel over sea as well as symbols of good luck for sailors. 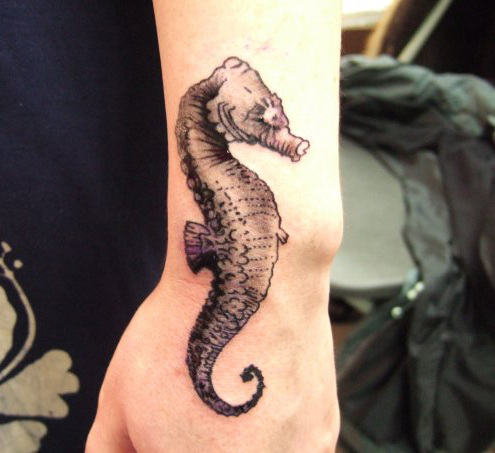 Because the seahorse is the only known male species that can become pregnant and carry its young safely through to birth, it has become a symbol to fatherhood but, because it is also extremely pretty, small and lithe, seahorse tattoos are, understandably, great favourites among women. The Chinese have imbued the seahorse with healing qualities and, because of its cherished aphrodisiac powers in the treatment of impotence, have declared it an endangered species, in need of protection. 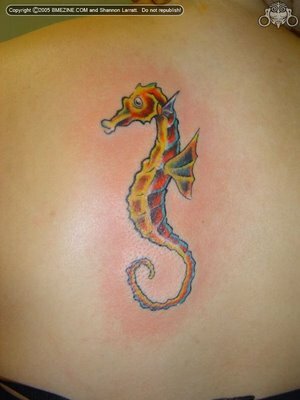 Seahorses are tiny; they range in size from about 5 centimetres to 30, so a large design on the body might well look out of place. 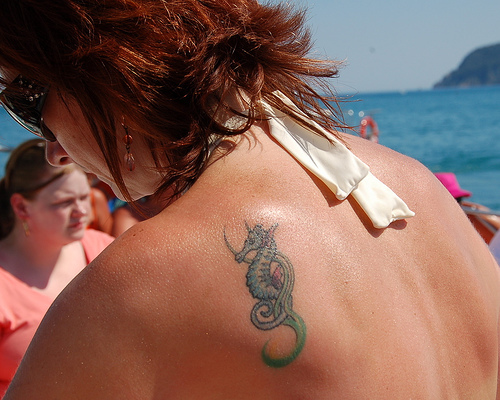 Because they are such attractive, compact designs, seahorse tattoos are particular favourites with women and preferred locations for them on the female body are ankles, wrists and arms. They can represent the dream-like mysteries of the ocean or symbolise the desire for free spiritedness – just like unconstrained miniature horses galloping over the ocean waves. For men, seahorse tattoos can reflect their protective natures and symbolise fatherhood or guardianship as well as traditional masculine qualities of natural strength and steadfastness. For others the choice simply reflects their affinity with the sea. 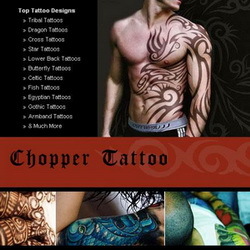 If you are still in any doubt about whether this design is for you, take a look at some of the wonderful seahorse tattoos in the on-line tattoo galleries and I suspect you will not hesitate for much longer.